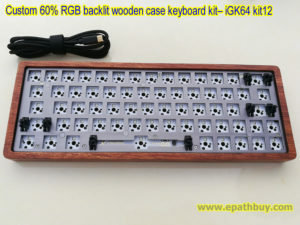 Wooden barebone kit without switches – you can plug your favorite MX-compatible mechanical switches into this kit, no-needing any tools, just need your hand, DIY your keyboard so freely! 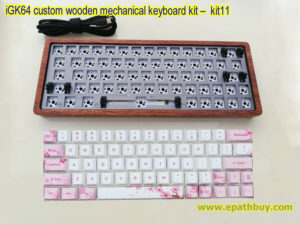 Custom iGK64(GK64) dye sublimation Cherry profile Sakura keycaps set, classic PBT keycaps set, OEM profile laser-etched photic ABS keycaps, DSA PBT keycaps set optional – build your own keyboard more easy! 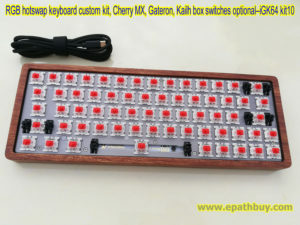 Best 64 keys hot swappable MX mechanical switches keyboard custom diy kits in 2019.